Public opinion surveys conducted worldwide over the last four decades have consistently found that between 70 and 80 percent of respondents believe that sentences are too lenient (Gelb 2006). Responding to research suggesting that judges are out of touch with public opinion, Chief Justice Gleeson of the High Court of Australia suggested that, instead of surveying uninformed members of the public, it might be more useful if jurors—as more informed representatives of the public—were asked about the sentences in the particular cases they have deliberated on (Gleeson 2005). 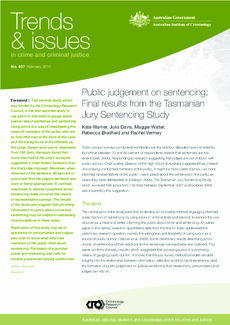 The Tasmanian Jury Sentencing Study, which surveyed 698 jurors from 138 trials between September 2007 and October 2009, was inspired by this suggestion.